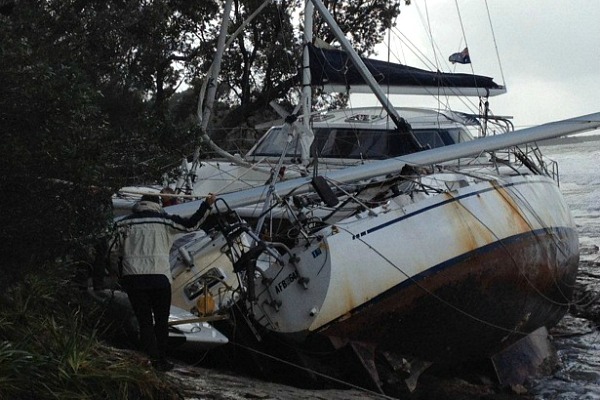 The strong winds and rough seas battering the NSW coastline wreaked havoc with moored vessels in Jervis Bay recently. Marine Rescue Shoalhaven Unit Commander Bill Carter said at least 12 yachts and a cabin cruiser had been wrenched from their moorings and washed onto the beach and rocks at Callala Bay. “In addition to the vessels washed up on the beach, numerous dinghies and tenders chained to trees and posts on the foreshore were either washed into the bay, smashed apart or buried in the sand,” Commander Carter said. “Many of the vessels still had their mooring buoys and lines attached. “One group of at least four yachts was piled in a tangled mess on top of rocks, although it was such a mess it was hard to determine the actual number of vessels in the pile. “Although the highest wind reading was only 43 knots at our Marine Rescue Shoalhaven Pilot Station at Crookhaven Heads this, combined with the large swells, was enough to cause such widespread damage. With high winds and surging seas continuing to pound the coast, Deputy Commissioner Heinz Mueller again appealed for boat owners to avoid taking to the water and to check their vessels’ moorings. “For their own safety, people should not venture out in these dangerous seas. As the damage at Callala Bay shows, it is easy for boats to break their moorings in these conditions and sustain severe and costly damage,” he said.